15:20 – What do the investors want to achieve? 17:44 – Would you be happy to take the deal? 25:45 – Beware of Timewasters! Get expert training, day to day advice, community support and deal by deal 1-2-1 coaching when you join the Goliath Sourcing Academy InsidersCircle. Click Here to discover more. On this week’s Q&A, Agi Keramidas has asked ‘When you package buy to sell or flip deals, what kind of percentage profit would you consider as a good deal? I’ve heard 10% but I would appreciate your insights.’ Now this is quite a common question that is asked with regards to flip deals. I will answer it in a few different stages and there’s no clear cut answer, there is no black and white. What you’ve got to be very careful with when you’re sourcing property and packaging deals for your clients or for investors is that you don’t discount potential deals because they don’t meet a criteria that someone has given you. For quite a long time, certainly over the last 12 to 18 months, the general number that investors were looking for as a net percentage profit, (the profits on their money invested after all costs had been taken off) was 20%. Now 20% net profit has become increasingly difficult to get. And the big reason for this is the market is probably more buoyant now than it was 18 months ago. A more buoyant market means that the sellers are less likely to accept big chunks of money off the price. What do the investors want to achieve? But what it also means is that there are a lot of relatively new investors coming in and accepting less profit and you’re going to be losing the deals to those people. So what you need to factor in is what is it that investors are likely to want to achieve. Is it a percentage net profit? Is it an actual number? Do investors want a minimum of £10,000? Do they want a minimum of £8,000? They might want a minimum of £20,000 and that can very much depend on the investor themselves. But as an idea we have shifted our flip criteria, we still look for a minimum of 10% but generally we look for a 15% return and a minimum of £10,000. So we’d want a minimum of £10,000 profit after all the costs. How are you going to know the difference and what are the best things? Well actually what we need to do is we need to have a range of investors that we’re looking to sell to, package and sell to, again you can factor in things such as bridging for example. So there may be an opportunity to buy these properties to be bridging yourself, which means you need less of an investment from your investor. You can pay them a percentage of interest on the money that they lend which means that you can afford to take a smaller profit. Ultimately that smaller profit isn’t going to fall into the 10% or 15% of the minimum £10,000, you just have to be sensible. What I would always say to people sourcing property is – would you consider that deal to be a good deal? Because the reality is that you are going to have to package and sell this to an investor. And if the numbers don’t tick the boxes such as the 20% net profit or the minimum of £15,000 or whatever it might be, you are going to have to sell that deal to your investor by explaining the pros the cons why they should take this etc. Would you be happy to take the deal? So you’re going to need to be confident that you would be happy to take that deal, if you had the funds you would take that deal for yourself. And that is the important thing to remember when you’re packaging and selling buy to sell deals, not necessarily the profit but more to do with the fact that is it a good deal and is it something that you would take for yourself? Hopefully that helps, Agi. If you or any of the other listeners do want to go into a bit more detail about that, feel free to drop comments in the Facebook group and we can go into it a bit more detail but hopefully that summarises what our thoughts are on percentage basis amounts when it comes to flipping properties. Great stuff, thank you. If you’ve got any questions or you want to discuss this and you’re not a member of the group yet, you can go to GoliathFBgroup.com. Just request to join and we will allow you access immediately. Then you can post your questions and we can carry on the conversation on the Facebook group. Let’s move straight on with the show. Next up is Sourcing with Mark. I want to welcome you to this session of Sourcing with Mark and this session is all about focus. We’ve had a lot of new members join our Insiders Circle recently following the 30-day launch. And already what I can tell is that there are a number of relatively new sourcers who are getting distracted by what is a very busy, noisy world – the property world. Now what I wanted to do as part of our webinar this month is on focus but I thought you know what, for the podcast for this week’s Sourcing with Mark I think it’s very, very apt. What made me come up with this and what made me think about this historically is when I’ve done one to one coaching, one of the first things we always do is get the students to write down a plan. Write down the goals, write down their weekly targets, their weekly activities and fit it into a weekly planner and then go about it. But before we do that we’ve got to decide what strategy they’re primarily going to be sourcing for, where they’re going to be sourcing. What’s the message we’re going to be putting out there? And all of this stuff is really, really important in order to stop you getting distracted. You know what I mean by being distracted as a property sourcing agent. Quite often what most people assume is a property sourcer has loads of time and if they’re a property investor who may be still in full time work or just really can’t be bothered doing the whole grunt work of trailing through estate agencies or writing loads of direct mail letters, maybe they don’t have a clue where to begin with marketing. So they’re going to want to leverage the property sourcer. Now what this means is for the keen property sourcer, especially when you first start out, one of the first things you are going to do is probably attend property network meetings. Now in attending your property network meetings, as soon as any of the investors work out that you are a property sourcer, they’re going to come up to you and say – ‘I’m looking for this, can you find it? I’m looking for this, can you find it? I’ve got a budget of this and I want this. Can you find it?’ And so on. And the reality of course is that as a newbie you’re keen. You’re excited, you want to take on as many clients as possible and what you’ll do is you’ll go – ‘Yeah. Yeah. Yeah I can do that. Yeah I can do that. Yeah I can do that. Yeah I can do that.’ Now where you will face a massive problem is that the reality is, it is unlikely that all of those investors are going to want the same strategy in the same area. Now they may want a similar area so for example in Leeds, they may want North Leeds they may want South Leeds, they may want East Leeds, West Leeds and they may want just on the outskirts of Leeds. If they’ve come to a Leeds meeting they might want Harrogate, they might want York, they might want Huddersfield, Halifax but the point is the likelihood is they’re not going to want the same thing in the same area. So what you’re going to be doing is you’re going to be then thinking right I’ve got all these investors, fantastic. Now how am I going to get deals for them all? Of course what you could do is you could send out marketing campaigns for every different type of strategy in all the different areas that you’ve got investors wanting. But that’s not going to do your marketing budget any good because you’re going to spread yourself too thin and not be able to have a consistent marketing approach. Of course, if you have got a budget of a £1000, £1500 a month for your marketing then, yeah you could maybe target a few different areas and with a few different strategies. But the reality is most of you listening will not have that as a monthly marketing budget so this is the first big point, which is all about focus. You need to really know what you are going to specialise in when it comes to property sourcing. Now this doesn’t mean that you’re not going to source other things by packaging deals that come in that don’t quite fit the main strategy but they’re going to be the exception rather than the rule. You want the focus to be on one particular property investment strategy. It’s in one particular area and you’re going to have one very clear message to the people that you’re sending out marketing material to, whether that be agents, whether that be homeowners whether that be landlords. The point is you’re going to have a very clear message. Very clear message, you’re not telling them No, but the point is you’re managing expectations and you’ve not got a load of investors out there expecting the world from you when you are over-promising and then you can under-deliver, which is not going to do you any good whatsoever. Now the other distraction you’re going to find is you’re going to find a number of property sourcers that are going to try and leverage your time, marketing budget, experience, property training. Perfect example of this – ‘I’m a cash investor looking for HMO deals in Manchester, has anyone got anything?’ Now if you’re sourcing HMOs in Manchester for outright purchasing then, yeah you can maybe get in touch and say and you’ve got some deals that might be of interest. But what you don’t want to do is think well there’s a guy that’s got a cash buyer. Or a really good example that’s currently going around seems to be these cash buyers that have up to £2m to £5m. I’ve already been approached by a number of different sourcers, newbie sourcers going – ‘We’ve got this fund of £5m’. They want to buy properties and you say – ‘Are you direct to them? No. Is there another sourcer? The likelihood is it’s probably through another three property sourcers and that is where the messages get diluted and deals fall through. Sounds great but trust me having done it now for a number of years in the property industry and in a couple years in the property sourcing industry you will find there are a lot of time wasters. People tell you they’ve got budgets of £5m when they don’t. What they actually have is the ability to get bridging finance but then the reality of getting bridging finance for those numbers is more difficult. So the chances are they don’t have that income and then it all gets very messy. So this is where your focus really comes into play because you’re not going to get distracted by those people. You can make a note of their details but certainly don’t go off and try and source property for those people because it is not going to work if it is not focussed along your primary strategy. The important thing is to remain disciplined. So in terms of getting your strategy, your focus in place what you need to do is you need to choose the main investment strategy that you’re going to focus on. So is it going to be rent to rent? Is it going to be property lease options? Is it going to be below market value property? Is it going to be property flipping? Remember like I mentioned before, it’s not your only strategy you’re going to source for but it’s your focus. Your main investment strategy is one strategy. Once you’ve got that strategy what you’re then going to do is you’re going to be able to choose. You’re going to choose an area that you’re going to focus on. So what is that strategy and what type of area does that strategy need to be in? Now you go find the area that that strategy is going to work best in. So you find your strategy, your area now you’re going to choose the marketing methods that you’re going to use. So you’re going to see if it is going to be direct mail? Is it best to go through estate agents? Are we going to do the private ads? Are we going to go through the HMO list? All of these things form part of each of the steps so remember – strategy, area, marketing methods and then to keep really focussed. You’re going to schedule your week with targets, KPIs of how you are going to approach the people that are most likely to be able to bring you deals to the table. Whether it’s agents, direct to vendor and you’re going to set that up. We call it your plan of attack. So your plan of attack is choosing your property investment strategy, choosing the area you’re going to do it in, the marketing message, what are the best marketing methods for that strategy, how you’re going to schedule your week. Set the targets up in order to achieve your goals for the week and then go out and get it. That’s the reality. Go out and take massive action. Now this week’s content upgrades are a KPI table to help you and also a weekly planner just to really help people focus in activity. But remember stay disciplined, don’t get distracted by other people’s noise. There are plenty of investors out there looking for the strategy that you focus on. Don’t run around trying to source for 20 different investors with 20 different plans. You will not do well. I will tell you now, you’ll spread yourself too thin. You will not have a consistent marketing approach, you will not build a consistent message and in effect you will become the equivalent to the jack of all trades, master of none. And you will not source and package deals, you’ll get deal desperate, you’ll start doing things that you regret and you still won’t get the fees because it will fall through in the end. Remember – focus, focus, focus! That’s what’s going to get you results. Hope you’ve enjoyed it. Happy sourcing. 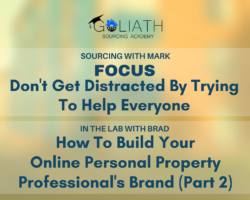 Welcome to this episodes of In The Lab With Brad – How to Build your online personal property professionals brand. Now this is the second instalment of a three part series. If you haven’t listened to Part 1 you can go back to Episode 18 for that first GoliathSourcingAcademy.com/session 18. Now it’s not vital that you listen to it but if the topic of building a brand online is new to you then Part 1 is a must listen as it will give you good context. So very briefly in Part 1, I talked about the power of building an online brand using an example of a property developer, who through the power of her online brand was able to attract a million pounds in JV funding in less than 24 hours from 28 different investors. Now that for me was quite a breakthrough moment in the property sector where the power of digital marketing really shone through. I also showed you an example of how personal online brand can help position property deal sourcers as authority and experts in the eyes of landlords and homeowners they’re trying to generate leads and interest from. Using digital marketing strategies and tactics to build your online personal brand is powerful. So the opportunity to reach more of your chosen audience is significant for those who choose to embrace it now. I’ve always said that the property sector lags significantly far behind in its levels of sophistication when it comes to digital marketing and therein lies the opportunity for property professionals to gain an advantage over their competition. So there’s a very brief summary of Part 1 in this series. Go back and listen to that in Episode 18 for more details. Now let’s look at some of the steps that you can take to actually building your personal online property professionals brand. Now this is possibly the most overlooked but very important part in the process of developing an online brand strategy. Ask yourself – Who are you going to serve? Who are you looking for your message to appeal to? By being clear about who your audience is, the rest of your online brand strategy falls very nicely into place. So for Goliath Sourcing Academy our audience is everyone that wants to source property deals. Now that’s actually quite broad. I like to see audiences as the layers of an onion. So on the outside of the onion the audience is quite broadly defined, now as you move in layer by layer, the audience narrows and becomes more defined. In the case of Goliath, the example that I am using the outer layer is anyone wanting to source property deals. But if we go a couple of layers into the onion the audience narrows to anyone who wants to source and package property deals to create a job-replacing income. So by narrowing the focus on who we’re looking to serve we can much more effectively focus our communication and getting our message across to them. So property deal sourcing agents will tend to have multiple audiences that they’re targeting – everyone from homeowners, to landlords, to investors, are all on the outer layer of the onion. But go a layer in and you start to narrow the audience to homeowners who are in mortgage arrears for example, or landlords being hit by higher tax bills for example. So targeting multiple audiences is fine and necessary in many ways. But be aware that the wider you cast your audience net the less focussed your message will be and the less likely you are to connect on a deep level with your audience. By an online home I mean a website, building your online presence on Facebook YouTube Twitter and other social networks is all part of the process but it’s essentially a means to an end. Now I’ll elaborate on what I mean by that in future steps but by having your own website you’re in control, it’s your asset online. It’s the equivalent of building a house on land you own rather than land you’re leasing with no lease agreement in place. Now what I see so often in property is people posting some really valuable info on their personal profile and doing a great job of positioning themselves as an expert but they have no website. They have 4,500 Facebook friends and they get some likes and shares but there’s no way for them to leverage their message and reach more of their audience beyond that Facebook post. Now if Facebook decides to shut your account down for whatever reason then you have no recourse. All that great work you’ve done to position yourself is lost. So by driving people to your website you control the platform that your message is communicated on. You need to create content that your target audience finds useful, valuable and positions you as an expert authority. So one of the key principles behind building an online brand is to produce as much value filled content as possible. Now at this point most people say – But what do I create content on? Or what do I create content about? The answer is simple. Create content that answers your target audience’s questions and helps them solve the problems that they have. Building a brand means being seen as a genuine expert and a go to person in the eyes and the minds of your target audience. The content you produce must genuinely be something your audience wants to know about. So often I see people producing content that is essentially selling their services. That’s okay to do once in a while but it quickly turns people away and off you if you do it all of the time. At Goliath Sourcing Academy we put a lot of resource into producing content that we genuinely believe is valuable and useful to you our audience. How do we know what to produce? Well we ask you, we ask you personally. We analyse the threads on Facebook groups to see what problems people are facing, what real problems people are facing. We log all the questions that come in from our website. We collate information from lots of different places on the problems, the hurdles and the challenges that you’re having. These all form the ideas for the content that we will eventually produce. Now doing it this way means that we’re always striving to create content that you actually want to listen to or read about or watch videos on etc. Create your content in a format you feel comfortable with and your audience will be most receptive to. So let’s go a layer deeper than the previous step and now consider what the best medium is to create your content on. Now there are fundamentally three mediums to choose from really. There’s written, there’s visual and there’s audio, or in other words blog posts, podcasts or videos. There are multiple variations and types of each but they all boil down to these three. It’s a case of just choosing one to begin with. When choosing you’re looking to find a balance between a medium that you feel comfortable with and one that your target audience will be receptive to. Now you’ll obviously be aware that at Goliath Sourcing Academy we choose to create a regular property podcast. Why? – Because we enjoy talking a lot obviously! And it’s easier and quicker for Mark and I to create audio content than it is to write copy. Most importantly we knew that you, our audience are busy people. You have hectic lives and the best way for us to get our message across to you is likely to be when you’re doing other things like driving or going to the gym or waiting for your daughter or son’s ballet or football training to finish. Now writing a 1,500 word blog post and expecting you to read it wasn’t realistic for us to do or for you to consume. So there are the four first four steps in the online personal brand building process. In Part 3 and the final part in this series, I’ll show you the steps that you need to take to begin to get your message out to as many of your target audience as you can. In the meantime you can download the free resource that goes with this which is the online personal property professionals brand checklist. This is a step-by-step checklist of everything that you need to do to get your brand out there and attracting your chosen target audience and positioning you as an authority expert. So you can get that if you go to GoliathSourcingAcademy.com/session19. Where should we send your Weekly Planner & KPI/Targets Spreadsheet? Where should we send your Property Professionals Online Personal Brand Checklist? Where should we send your Episode 19 PDF Transcript?